Walking can help to make you feel happier. In fact, it’s been scientifically proven that being in nature can boost your mood. A report by the Ramblers and Macmillan Support highlights the benefits of walking. The report says that if people walked regularly for just 150 minutes a week (the amount recommended by the UK’s Chief Medical Officer) it could save 37,000 lives a year. 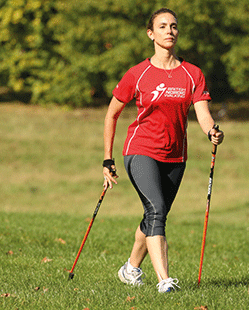 If, however, you’re looking for a full body workout, why not give Nordic Walking a try? Not only is it fun and suitable for all levels of fitness, you use 90 per cent of your muscles and burn more calories than normal walking. It tones the upper and lower body at the same time. It reduces the pressure on knees and joints. It is particularly good for cardiovascular health. It can help people who have joint problems to move more easily. Nordic Walking involves the use of specially designed walking poles, which help to propel you along. You might get the odd passer-by asking, “Where are your skis?” But what they don’t know is that by using the specially designed poles you are also giving your arms a good workout and burning more calories. Don’t worry if you don’t have a pair – instructors include poles as part of the cost of the class. Prices for classes start at £5 and are free in some areas. Nordic Walking is sociable as you can chat as you walk and participants enjoy the sense of community too. Often a class will end at a local café. You can walk anywhere including the countryside, parks and varied terrain. You can even walk in snow. It’s suitable for all ages and fitness levels. There is no need for specialist clothing. According to government guidelines you should be walking for 150 minutes a week. This could be broken down into 30 minutes of exercise – five days a week. Here are some tips to get you started on your Nordic Walking journey. Learn the technique. Book a class with an INWA (International Nordic Walking Federation) instructor who will teach the 10-step technique for Nordic Walking. This will help to ensure that you are Nordic Walking properly and get a proper full body workout. You can find a huge range of instructors who take people walking along the coast in Cornwall, in the countryside of Norfolk, across Bristol, Lancashire and even up Mount Kilimanjaro! Start with a beginners’ class. These are taught in your local area at a relaxed pace. Once you have learned the technique you can join a friendly group that meets regularly. You can find classes on the British Nordic Walking website: britishnordicwalking.org.uk/apps/store-locator or by calling 0115 8483801. Find a walking buddy. Arrange with friends to take a walk at the weekend. Nordic Walking can be enjoyed at any time of year and in glorious sunshine, snow, rain or mud. Once you get outside and reap the benefits of the free, outdoor gym, you’re sure to be hooked!